Announcements are updated frequently, so please check back often! 11 May 2017 - Both potable and irrigation water are available in serviced areas of the park for the 2017 season. Three new / amended Bylaws have been posted to the Rules and Regulations page, governing the general park rules, nuisance abatement, and buildings. Please review them at your convenience, especially if you are planning any construction and/or renovation projects this season, as a permit is required whenever work regulated by the Act or Regulations is to be undertaken within the park, and permit applications take some time to review and process. If you have questions, comments or concerns, please do not hesitate to contact the Park Office. Palliser Park is replacing the docks and fingers on the launch area at the marina in a project that will run over the next several years. Docks are being manufactured at Marine Master in Saskatoon. After much research, the park authority found Marine Master to be the best choice. These docks will be aluminum with cedar tops. Before docking your boat for the season, please check with the park office or the marina supervisor to ensure dock replacement will not be temporarily affecting your slip's availability. The park is in year 4 of a 4 year plan to rejuvenate the picnic tables. The park will be procuring 40 tables each year at a cost of about $8000.00. The new frames come from Dumonceau's Trailers in Central Butte. The color is so nice to see in the Park and in addition we are able to direct people that have never been here before to their site by telling them what color to look for. It is for this reason we ask that patrons please not move the colored tables out of their area. Feedback at the office is that everyone likes the new colored picnic tables! Girl Guides and Tim Horton's Clean-up Day! 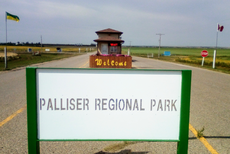 Palliser Regional Park would like to offer A BIG THANK YOU to the Riverhurst Girl Guides group! The guides come to the Park every year for the Tim Horton's Community Clean Up Day and help us tackle that spring garbage. Great job guides! !